Shares opened 1.4% lower after the materials company's second quarter report and retreated further throughout the day. What's got investors so spooked? 3M (NYSE:MMM) reported its second quarter results before the market opened on Tuesday, July 26. Per-share earnings were up 3% over the second quarter of 2015. Operating income margin rose half a percentage point to 24.4%. Not bad. Not bad at all. But the market seemed to think otherwise, sending the company's shares lower at the bell, and lower still throughout the day. Earnings are often an expectations game, with a company's stock rising or falling based on how well (or poorly) it performed relative to management's forecasts and analysts' predictions. In the case of 3M, which doesn't release quarterly forecasts -- focusing instead on yearly outcomes -- it tends to be all about the analysts. In this particular case, though, the company managed to meet or modestly exceed analysts' expectations...only to see its stock price fall anyway. Analysts' consensus estimate, according to Thomson Reuters, was EPS of $2.07, and the company delivered $2.08 per share. Analysts expected a full-year forecast of $8.26 per share, which was right in line with the company's revised estimate of $8.15 to $8.30 per share. True, it wasn't an upward revision: The company had previously estimated a wider range of $8.10 to $8.45, but it wasn't revised downward, either. A possible cause is the stock's outperformance in the first half of 2016. 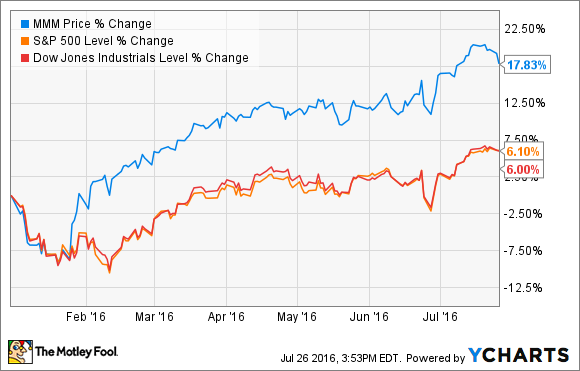 The stock has gained almost three times as much as the Dow or the S&P so far this year. The drop in stock price may have been due to investors' questioning whether the stock's gains so far this year were justified by the company's middling results. In any case, it just goes to show that investors should keep an eye on the long term when buying a stock since even a big and solid company can be subject to unforeseen market moves despite being in no apparent trouble. It's also worth noting that even with the post-earnings losses, the stock is still way up for the year. One of 3M's weakest divisions in recent quarters has been its electronics and energy business. In the first quarter, sales were down 14%, while operating income plunged a jaw-dropping 27%. At the time, Thulin predicted the unit would recover over the course of the year, finishing 2016 with only a modest year-over-year loss. But if the recovery is coming, it certainly hasn't started yet. Organic, local-currency sales were down another 9.1% in the electronics and energy unit for Q2, making it the company's worst performing division by far. Even worse, operating income was down $229 million, or 18.1%. The major culprit seems to be electronics, where sales declined 14%. The energy unit's drops were more modest, and its telecom sales even grew slightly, although they were more than offset by weakness in other areas. It's also important to note that the unit's weakness was centered in the Asia-Pacific region. Energy and electronics sales in the Americas were flat and actually gained in the Europe-Middle East-Africa region. For a global company like 3M, even a single weak region in a single business category can have an outsized effect on a business unit and the company as a whole. Besides showing us details about the company's overall performance in the quarter, the quarterly earnings report gives the opportunity to look at how the company is spending its money. And 3M is spending quite a bit in two noteworthy places. The first is on itself, in the form of research and development. The company spent about 5.7% of its net sales on R&D, unchanged from a year ago. With fully a third of the company's sales coming from products invented in the last five years, and with competitors slashing their own R&D efforts, investors should keep an eye on this number. The second is on its shareholders. 3M paid its shareholders $672 million in cash dividends during the quarter. But it didn't stop there: It also repurchased $828 million of its own shares. 3M is continuing to reward shareholders for hanging on to its stock. Of course, if the company has to use debt to finance its R&D, its dividend, or its buybacks, that could be a potential red flag for shareholders. And sure enough, the company has about $1.3 billion less cash on hand and about $2.5 billion more in debt than it did at this time last year. And although it still has $1.7 billion in cash on hand, these numbers are heading in the wrong direction, which means it's something shareholders still need to keep an eye on. 3M's shares dropped on slightly positive numbers, probably reflecting investors' nerves about how far the stock has risen already this year. In spite of weakness in electronics sales in the Asia-Pacific region, the company is still making money and fully funding its R&D efforts. But investors should continue to keep an eye on the company's cash position and debt load because if the company continues spending cash and taking on debt, it could find itself in an unhappy position in the not-too-distant future.